Viral website points to Sony iPod challenge? 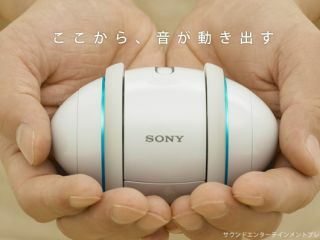 We say 'looks like' simply because the site is little more than a viral marketing campaign for the rumoured new Sony audio player known as Rolly and which is apparently shaped like an egg. While those notions remain speculation, we can tell you that the Rolly World site is a mess of tiny videos of unrelated trivial content, such as ducks walking by the camera, taxis and the various clappy-happy sorts that marketing suits like to patronise their customers with. There is also a scrolling selection of words, such as 'shuffle', 'small' and 'music' that suggests the Rolly may be aimed at the bottom end of the DAP market currently occupied by the iPod shuffle and nano. Of course, we're still just guessing here - Sony Japan hasn't commented officially on the project. Other parts of the site include a rather dull Japanese-language blog and a competition to win tickets to a Rolly part on 10 September, which could well be the launch event. Incidentally, the odd name isn't unique in the Japanese music world. There's also a borderline glam rocker who goes by the very same name, and who happens to be on Sony's books right now. Perhaps we've all been barking up the wrong tree.